Small haul this week. I've been trying to read books that have been sitting on my shelves for who knows how long, so I haven't been borrowing too many books from the library. Last week, I actually had no library books at home for the first time in probably a year, which seemed so strange. I picked up one this week, though, and I also bought a copy of Unspoken by Sarah Rees Brennan. It's going to be getting a mid-series cover makeover, and I really love this particular cover, so I wanted to make sure that I grabbed a copy of this edition. I still need to read Unspoken. I am so behind. And I liked Of Poseidon, but didn't love it. However, the sequel, Of Triton, was really amazing. One of my favorites from this year for sure. 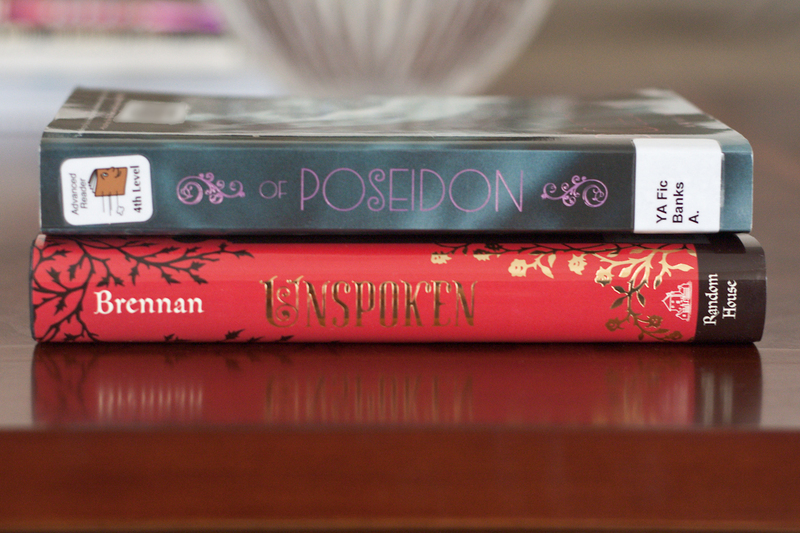 I really enjoyed Of Poseidon and I've been really curious to see what Unspoken is about :) Great haul! I loved Unspoken because it made me laugh so much. I don't know if anyone else found it that hilarious, considering that the story gets pretty dark sometimes, but the humor was just perfect for me. I still have not read Unspoken, even though I have heard nothing but good things! I love that book with all my heart; definitely one of my favorite reads from this year! I was a little bummed to find out about the cover change for the Lynburn Legacy series because I think this cover is amazing. I didn't want to wait too long and find myself without a copy. Unspoken sounds so good! I really love the cover. :b I hope you enjoy everything! I was upset with myself for waiting so long to get around to reading Unspoken; it is such an awesome read! Old follower via bloglovin. Unspoken looks interesting. Come check out my haul as well. It quickly became one of my all-time faves. I'm glad to finally own a copy! I am still listening to Of Poseidon! I got a little past page 100 last night, and it's still not doing anything for me. In fact, I'm finding it quite tough to get through. I hope you're having better luck with it! I too haven't borrowed any books from the library, trying to focus on my personal library. I bet it is so strange to not get all the library books! 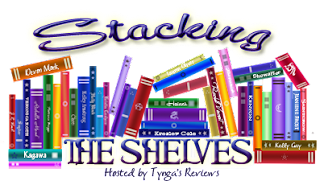 I hope you are having fun working your way through your pile :D Jaclyn @ JC's Book Haven. It is strange! My coffee table looks so empty without a library stack, but I really want to make a dent in the pile of books that I own. I need to read Of Poseidon at some point. I've heard a lot of good things. Happy reading! I was excited to finally read a book about mermaids, but so far, it hasn't really been my type of read. I hope it gets better . . . . It's one of my favorite book covers; I love the silhouettes on it. It's also a fantastic read- I hope you get to read it soon! Ahh this reminds me that I still need to read Unspoken! I've been really trying to make time for popular 2012 books that I want to read. I've so far managed to squeeze in Tiger Lily and Stormdancer. But I feel like I keep adding to the list so it's not getting shorter :) Anyway.... I hope you love it :) And Of Poseidon too! My cousin Ally loved Tiger Lily and has been trying to get me to read it for ages. I also still need to read Stormdancer. I understand how it is to have an ever increasing TBR list; I've pretty much resigned myself to the fact that I'll never reach the end of mine, lol. I still need to read Unspoken, and the cover really is gorgeous too! And as far as the library-I'm just as addicted to stalking their shelves and eBooks! Enjoy your reads! 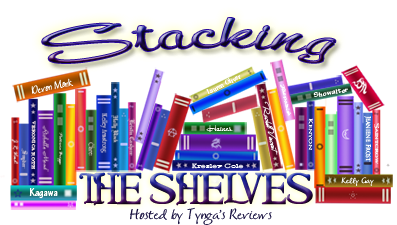 Lately I've really been trying to tackle the books that are already on my shelves, so I've been leaving my library card at home so I won't be tempted to go on a borrowing spree! My cousin liked Of Poseidon, but I think she and I might end up with differing opinions on it. Nice! Of Poseidon is on my want-to-read list. Enjoy and Happy Reading! Good thinking on snagging a copy of Unspoken before they pull the old cover switch. I doubt the new one will be as stunning as this version is! I still need to read it so it might be a good time for me to pick up a copy as well :) Of Poseidon is another one I'm curious about so I'll be eager to read your thoughts! Happy reading Lee! I've seen the cover redesign, and I much prefer this one. Definitely pick up a copy of the original cover while you can! I finished Of Poseidon earlier in the week, and it wasn't my thing at all.